To say the new DreamStation CPAP machines from Philips Respironics are full-featured is an understatement. 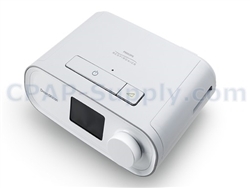 The DreamStation CPAPs are available in three different models – CPAP, Pro, and Auto. The CPAP and Pro models are fixed-pressure units, while the Auto model is an automatic CPAP which adjusts pressure automatically based on the needs of the user. While there are some differences between the models, they all share some common features, like exhalation pressure relief, compliance reporting capability, auto on and auto off, heated tube compatibility, and Bluetooth. In this article I want to focus specifically on the Bluetooth feature and how it can be used with the Philips Respironics DreamMapper app for mobile devices. First, I’ll briefly cover some of the other key features, and then go into detail about Bluetooth and DreamMapper. On the DreamStation machines this is called C-Flex (on the CPAP and Pro models) and A-Flex (on the Auto model). This feature allows the pressure to be reduced by up to 3 units during exhalation, making therapy a bit more comfortable while reducing mask leaks. It’s a great feature for anyone who’s new to CPAP therapy or for anyone who has a relatively high pressure setting. The flex functionality is very similar to that of bilevel (often referred to as BiPAP) machines, with the only difference being that a machine with exhalation pressure relief is generally limited in its pressure reduction during exhale, while the difference between inhale and exhale pressure on a bilevel machine can be quite large. The flex concept, though, is exactly the same as the bilevel concept. With C-Flex on the DreamStation you can choose a pressure reduction of 1, 2 or 3 units of pressure. So, if you have a pressure of 10 and a C-Flex setting of 2, your inhalation pressure will be 10 and your exhalation pressure will be 8. Some users need to prove to someone they’re using their machine. A Medicare beneficiary will have to prove compliance during a 13-month rental period. A truck driver may have to prove to his employer or to his State Department of Transportation that he’s using his CPAP machine at least 75% of the time. 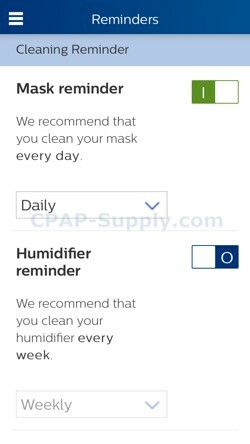 These types of CPAP users require a machine with compliance reporting capability that shows information like AHI (apnea hypopnea index) and the number of nights with usage of at least 4 hours per night. All DreamStation models record this information and can display it on-screen and within the DreamMapper app. All models also have SD cards that store the information for retrieval by clinicians. All models also have phone in compliance reporting capability. The on/off button isn’t even necessary on the DreamStation machines. With the auto on and auto off features enabled the user can simply start breathing into the mask to turn the machine on. To discontinue use the user simply has to remove the mask and let the machine turn off automatically. I believe the original purpose of this design was to allow Orthodox Jews to be able to use their CPAP equipment on the Sabbath. In their religion it is forbidden to “light a fire” on the Sabbath. Many Jews consider using a switch on an electronic device as equivalent to “lighting a fire”. Many people who have no religious considerations regarding electricity find this feature convenient. A happy win-win situation. All DreamStation models with heated humidifiers are compatible with the DreamStation heated tube. It’s an option that helps manage condensation or “rainout” in the tube. A heated tube warms the tube wall and the air inside the tube to allow more moisture in the air (since warmer air can hold more moisture). This reduces the amount of condensation on this inside of the tube. The problem with too much condensation is that it can accumulate in low spots in the tube, like where the tube dips down between the nightstand and the bed. When water accumulates in a low spot, the air pressure will eventually blow that water out of the tube and into the mask, which can disturb even the soundest of sleepers. This is becoming a more common feature on CPAP machines. Bluetooth is a short-range, wireless communication technology that allows properly equipped devices to transfer data back and forth. Bluetooth functionality on the DreamStation machines in and of itself doesn’t do anything useful for you. It’s only useful when you have another Bluetooth-enabled device setup to communicate with the DreamStation. If you have a Bluetooth-enabled iPhone or Android device you can create a link between your DreamStation machine and your mobile device – running the DreamMapper app - so that you can see valuable information about your CPAP therapy right on your mobile device. 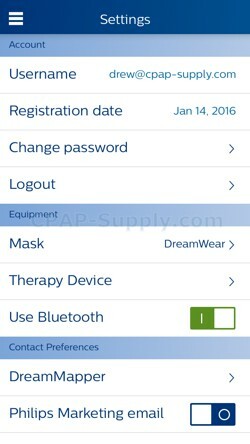 Once the link is created between the devices, you can fire up the DreamMapper app to see some of the information your CPAP machine has recorded. It’s really pretty cool. Step 1: Install the DreamMapper app on your Bluetooth-enabled mobile device. You can find this in the Apple App Store or in the Google Play Store. Step 2: Follow the instructions in the app for connecting the mobile device to your CPAP machine. During this step you’ll need to register your CPAP machine with the CPAP machine serial number and an email address, and a code will be displayed on your CPAP machine screen. You’ll enter the code on your mobile device to establish the link. 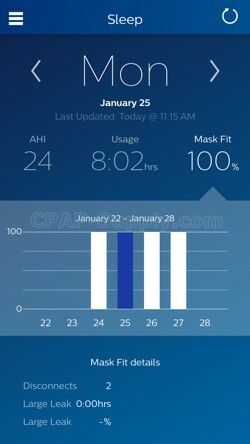 Setting up the connection between CPAP machine and mobile device is very easy. Once that connection is setup all you need to do is use the CPAP machine. 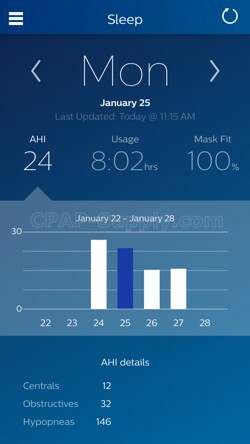 Then any time you open the DreamMapper app – with your CPAP machine plugged in and within 30 feet of your mobile device – the app will be updated with new information downloaded from the CPAP machine. Here are some screenshots of the DreamMapper app taken on an iPhone 6. You’ll notice that the DreamMapper app provides not only a basic compliance summary, but also allows you to set usage goals and shows your progress toward those goals. 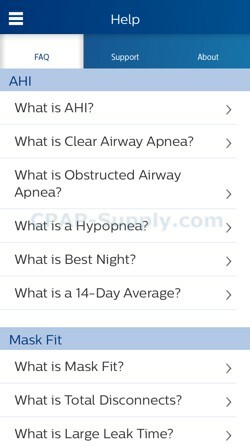 There are also educational sections of the app which provide useful information like answers to frequently asked question and short training videos to teach you about CPAP therapy and your DreamStation device. 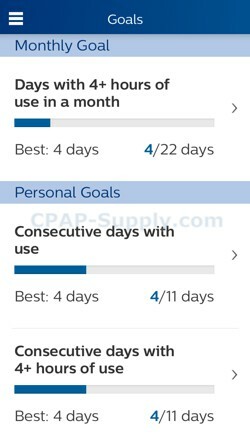 Tapping on Usage takes us to a screen that shows hours of use on the selected day, a chart showing hours of use during the week, and then usage details underneath the chart. On this screen we can see that usage was 8 hours 2 minutes on Monday,January 25. On the chart we can see usage hours for Sunday, Monday, Tuesday and Wednesday night, with some usage details like start pressure and ramp time below the chart. Tapping on Mask Fit shows us details about... you guessed it: mask fit. Above the chart we can see that the mask fit was 100% on Monday, January 25. The chart shows that the mask fit was 100% on all four nights the machine was used. The mask fit details below the chart shows there were two disconnects - like when you get up to go to the bathroom - and no time spent in large leak. 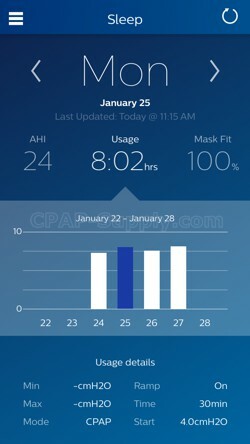 If you're a goal-oriented CPAP user the Goal screen might be right up your alley. On this screen you can set usage-related goals. In this case the user set a goal of 11 consecutive days (the default goal setting in the app), and the app is reporting that he's used the machine for 4 consecutive days out of the 11. The app also shows the highest number of consecutive days for the month, regardless of whether or not you've set any goals. This goal setting feature is beneficial to anyone struggling with compliance and who needs some motivation. Who doesn't need a reminder every now and then. All CPAP users know they should clean their equipment and change their filters from time to time. This part of the app can keep you on schedule. Some of the app screens, like this Reminder screen, are scrollable, so the screenshot doesn't show everything. The reminders are: mask, humidifier, tubing, filters, insurance follow-up. You can toggle the reminders off and on, and you can choose daily, every other day, weekly, or monthly. For the insurance follow-up reminder you can select 30, 60, 90 or 120 days. The screen above is a boring settings screen that pretty much explains itself. Call us with questions or comments, including questions about pricing. That's what we're here for.